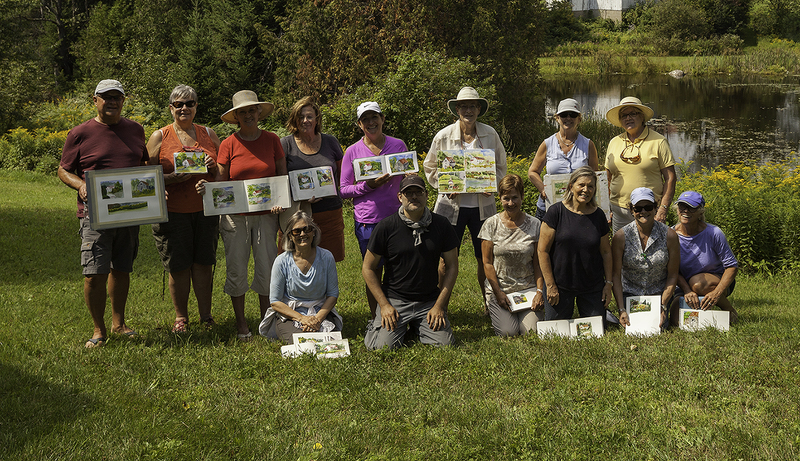 I’m just back from sketching with the Dunany Studio Artists out near Lachute Quebec. They’re a wonderful group of dedicated painters who meet weekly. You can tell they’re serious about painting, willing to try out new ideas, and to work hard at it. You can also tell they’ve been painting together for awhile. The group has a friendly, relaxed feel that makes them a lot of fun to paint with. This lakeshore view was my demo from the afternoon session on day two. Our host had put us up the night before at a cabin on the lake, allowing us to experience getting up early to the mist on the water and the sound of loons calling. I can see the attraction of this kind of life. I had a great time just painting and philosophizing about art with the group, while imagining this was my own back yard view. Over the two-day paint out, we tried a variety of exercises aimed at making better compositions in watercolor. I had students do a 15 min sketch, making bold silhouette shapes directly with the brush – something that might have been frustrating – but they were all willing to give it an honest try. Later on we moved to tinting miniature compositions we’d sketched with as little as three-to-five lines. All this was working towards the kind of bold, direct painting you might do when sketching on location. If you’re aiming to work quickly that is. 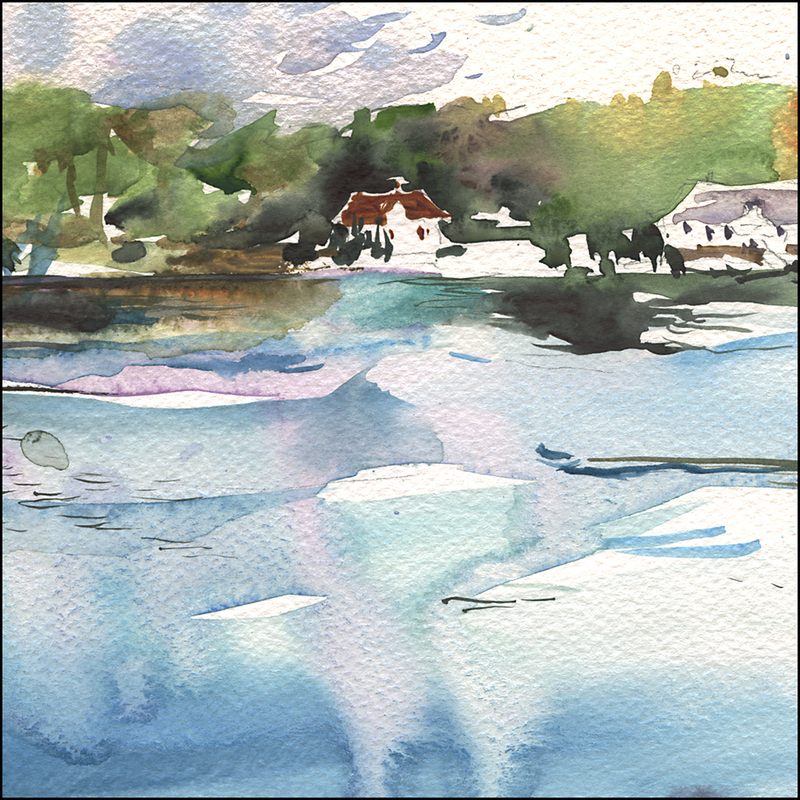 Getting a sketch in an hour or so – in a watercolor sketchbook, or on a small format sheet. Lately, I’ve been emphasizing strong simple compositions that I call The Three Big Shapes. In this approach I try to eliminate any unnecessary clutter to make the final image as graphic as possible. In this painting, I’ve left out the underbrush in the foreground, omitted some overhanging trees and ignored a dock. All with the goal of making as few shapes as possible. It’s just Sky, Land, and Water – and a few cabins made out of the negative shapes left behind. Of course, you can’t always do it in just three shapes. Sometimes it requires more. But the goal is as few as possible. What can you leave out, or merge together, in order to make stronger compositions? This emphasis on simplification helps you see big shapes that you can fill with bold color. Working with very wet paint put down on dry paper, I’m letting each brushstroke fuse into the next – allowing juicy pigment to merge right on the paper without any blending or glazing. Other than making pale washes for the sky, there’s almost no mixing on the palette required. So, a big thanks to the artists out in Lachute for trying these ideas out with me. And of course, if you’re interested in seeing some of this in action yourself, I hope you’ll try out my new video class on Craftsy.com: Travel Sketching in Mixed Media. These videos, along with my books, are the livelihood that allows me to keep up this blog. I appreciate all your support! 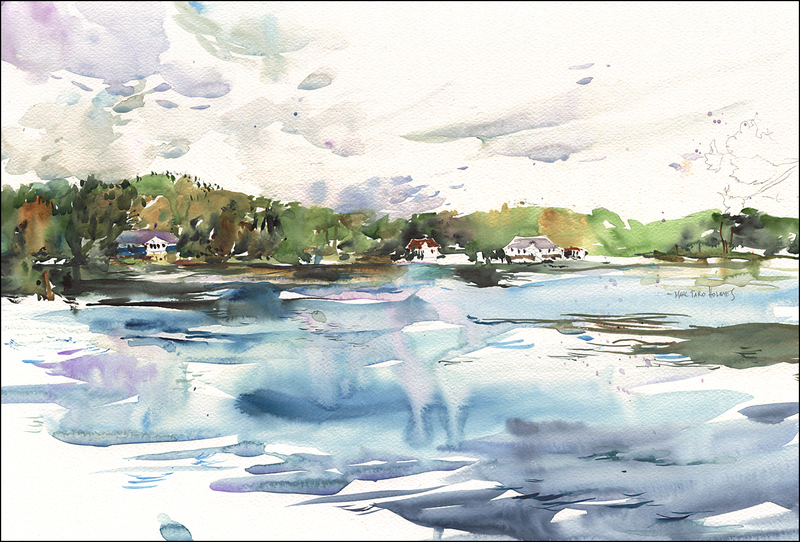 ← Announcing a new video lesson: Travel Sketching in Mixed Media! Very nice work beautiful watercolors! I’m really looking forward to your new course. The Craftsy app is so wonderful to use. I love that I can download the class and watch it during my commute. And I’m sure you’ve heard this many times but I have to say thank you for being such a generous person with your knowledge. You have been instrumental in getting me out there stretching. Also wondering if you’re doing any classes or demos in Sept? As for classes (live ones I assume you mean) – unfortuantley not this year. The next thing I have on the roster is the sold out event in Portugal next March. I have some new videos coming this fall (in addition to the craftsy class opening tomorrow). But other than that, I’m done for the year, as I have a large book illustration projects on the go which will occupy me from now till January. So – keep watch for plans that will be announced soon for the rest of 2016 however. There are things in the works that I’ll be able to talk about soon. Downloaded the class yesterday and watched the first segment on the train this morning. Went right out at lunch today to put it to practice. It was fun! I really how the water is painted, it really leaps out!